With voter turnout above 85 percent, unionists had a nearly insurmountable lead in the vote count Friday morning. EDINBURGH, Scotland — Given a historic chance to go it alone as an independent nation, Scottish voters instead appeared early Friday to be sticking with the United Kingdom in a vote that was marked by extraordinary turnout. With most of the vote counted as of 5 a.m., the “no” side had built up a nearly insurmountable advantage, and unionist leaders said they were confident Scotland had voted to remain part of the United Kingdom. 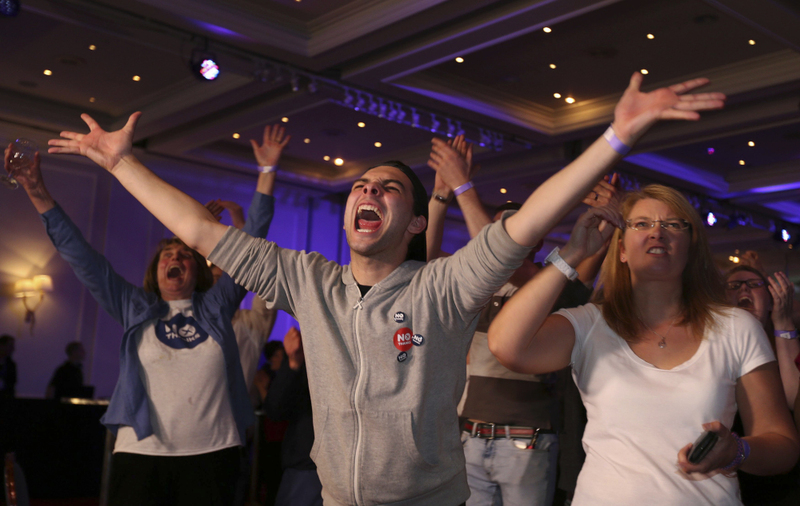 At unionist gatherings across Scotland, supporters erupted in raucous celebration, and the BBC declared a “no” victory just before dawn. Independence leaders, meanwhile, appeared somber and acknowledged disappointment, but did not immediately concede defeat. A “no” vote would mean new life for a 307-year union that had appeared in grave danger of breaking apart. The apparent unionist victory was already being heralded early Friday by relieved British officials who had come perilously close to having to preside over a messy and humiliating divorce. Instead, Britain appeared set to remain whole, and “yes” voters’ dream of an independent Scotland could be dead for a generation or more. But a defeat for the referendum is unlikely to do anything to blunt calls for greater regional autonomy in a country that has had one of the most centralized governing structures in the West. The announcement of results came just hours after nearly all of Scotland turned out to vote on Thursday in a referendum marked by civility and passion. The vote offered residents of this ancient land the chance to create the world’s newest independent nation by breaking up one of its oldest unions. From remote and pastoral islands to the gritty, post-industrial streets of Glasgow, Scots had lined up in the early-morning mist on Thursday, and kept coming through the day and well into the night. 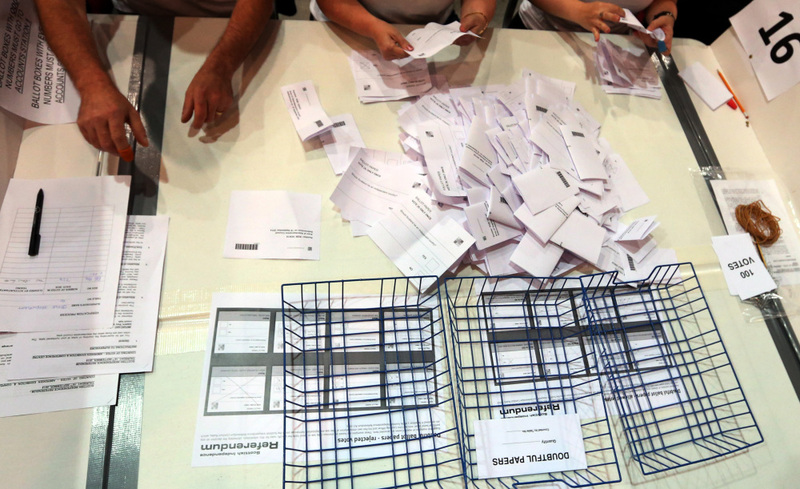 The campaign deeply divided Scots, with pre-election polls showing voters almost evenly split. After two years of virtually non-stop debate and discussion, tempers flared in the final weeks, and both sides charged the other with intimidation. But on the whole, the referendum debate was remarkable for the seriousness with which voters weighed such a profound choice, and the peaceful manner in which they expressed it on Thursday. All through Thursday, Scots calmly and resolutely voted, while flag-waving activists sped through towns and cities, knocking on doors and offering rides in a frantic push to maximize turnout. 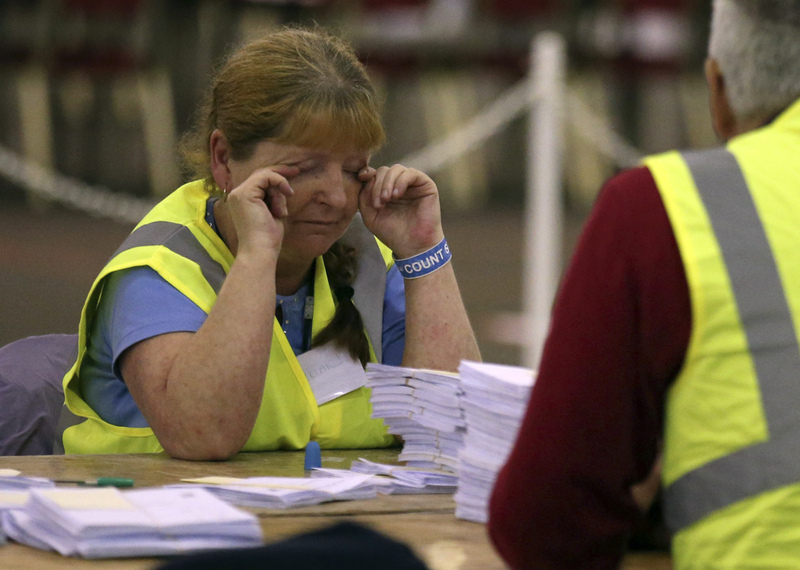 Turnout across Scotland was hovering just above an astounding 85 percent. Now, Scotland will be under pressure to quickly heal its divisions. Inevitably, Friday’s result will leave nearly half the nation deeply disappointed. Independence advocates had been pushing for Scotland to make a break from the United Kingdom for decades, and defeat could defer their dream for a generation or more. Independence leader Alex Salmond said repeatedly in the debate’s final days that he would not advocate for a new referendum if “yes” loses, even if the vote was close. A “yes” win would have forced unionists to grapple with the idea of losing a national identity. “I’m very proud to be Scottish. I’m also very proud to be British,” said Angus Bruce, a 73-year-old retired whiskey salesman. If he could no longer be both in Scotland, Bruce said on Thursday before the results were in, he and his wife would consider moving to England. Indeed, the vote carried vast implications not only for Bruce and the 5.3 million people of Scotland, but also the 59 million people in the rest of the United Kingdom who would have been left behind if Scotland had chosen to break apart. A “yes” outcome Thursday would have set Scotland on a course for independence by 2016, and would have precipitated intricate and difficult negotiations between British and Scottish authorities over the terms of divorce. North Sea oil revenues, Britain’s nuclear weapons program and the use of the pound sterling would have all been on the line, along with dozens of other questions as the two sides divided this island along a border that has hardly functioned like one since 1707. The apparent victory for ‘no’ will be far less jarring, but will come with its own set of complications. As polls tightened in the final weeks before the vote, the leaders of Britain’s three main parties – including Prime Minister David Cameron – tried to entice wavering Scots by promising them greater autonomy if they chose to stick with the union. But the leaders disagree over the details, and the promises have spawned a backlash among some in England who worry that Scotland is being given a sweetheart deal at their expense. Britain’s leaders – who have been an object of scorn throughout the campaign – will now be under pressure to deliver on their promise of devolved powers, and prove they have heard the message from voters who see London as out of touch. Scotland already has its own parliament, with responsibility for managing the nation’s health care, education and legal systems. But Scottish independence leaders – who came to power in Edinburgh on a platform of giving the nation an up-or-down vote on independence – have argued that Scotland’s people need complete control over their own affairs. Nationalists said an independent Scotland, unshackled from London’s austerity-minded Conservative-led government, would have been modeled on Scandinavian countries that spread their wealth broadly and offer their citizens a generous package of government support. Unionists sought to portray the nationalist agenda as a fantasy. Many independent economists have agreed, questioning whether Scotland can build the sort of egalitarian society that its leaders envision, especially with declining oil revenues and uncertainty hovering over the newly independent nation’s currency. The “no” side’s warnings of economic doom spurred a backlash among Scots, however, and prompted the pro-union camp to recalibrate its message . In the final days, unionists emphasized their love for Scotland – not their prophecies of failure. Polls suggested the shift may have helped halt growing momentum for independence in the campaign’s final days. Scotland’s vote Thursday was closely watched around the world, not least in Washington, which has looked on anxiously – but mostly silently – as its closest and most reliable ally faced partition. While U.S. officials initially said they would stay completely out of the referendum debate – arguing that independence was a matter for the Scots, not for outsiders – tightening polls led President Obama to gently intervene.